Every part of a compressor needs to be systematically cut, molded, and created in order to work properly, which is why a laser metal cutting machine is essential when making compressor valve plates. Well-crafted compressor plates, also called compressor valve plates, can mean the difference between an efficient compressor and one which costs a manufacturer money with each work cycle. A high quality compressor plate is a wise investment. In order to understand why a laser metal cutting machine is essential in creating compressor plates, it’s important to comprehend what compressor plates are and how they operate. Since the materials used to create this important part is a matter of upmost importance, we will also consider the optimal material for compressor valve plates. What are Compressor Valve Plates, and What Do They Do? Compressor valve plates are vital to the performance of any compressor. They are the regulators of the system. Compressor valve plates seal the gap between areas of pressure differential throughout the system’s compressor cycle. When the matter within the compressor (gas or otherwise) is uneven, the valves open, allowing it to move freely and safely from a high pressure area to a low pressure area. This happens again and again as the compressor moves through its work cycle. A precise fit is essential for the compressor valve plate to properly perform its task. Because the valve plate’s job is so important, it must be durable and constructed of high quality material. All of these and more can compromise the performance of the compressor valve plate, and thereby of the entire compressor. Downtime is costly and frustrating, but it can be avoided by using the right composite and application of the valve plate. When a valve plate is carefully constructed and designed with an eye to thermal stability as well as overall durability, it can provide vitally reliable service for quite some time. Since compressor valve plates are not “one size fits all,” achieving optimum design and a carefully crafted product is essential. The valve plate, in addition to being resilient, must also prove to be durable, as it will play a vital role in each and every work cycle. To avoid vibration and provide for a safer work environment, the valve plate should also be quiet and highly efficient. When a compressor valve plate is said to be dimensionally stable, the speaker is referring to its ability to retain its shape and properties while it is operated according to its intended purpose. Dimensional stability is maintained when a machine part like a compressor valve plate uses a laser metal cutting machine to be carefully and properly cut and made of the proper material. Most people think of high-end home appliances when stainless steel is mentioned. Stainless steel is an alloy of steel, nickel, chromium, and a small amount of carbon. Stainless steel does not conduct electricity and can withstand wide temperature variations. This means that, unlike a stainless steel refrigerator, a stainless steel compression valve plate more carefully cut. Different kinds of stainless steel are best applied to different parts and functions. Grade 410 stainless steel is ideal for compressor plates which will use a laser metal cutting machine. The ability to withstand final heat treatment. In addition, Grade 410 stainless steel can withstand operating temperatures to about 500 degrees; it can also easily withstand welding and machining. This steel is best applied in a hardened, stress-relieved state, and is known for its ability to withstand constant mechanical wear. Valves which are not made of metal usually leak more. Besides plate valves, Grade 410 stainless steel also appears in bolts, gas turbines, screws, and the rungs of mine ladders. Most importantly, Grade 410 stainless steel lends itself to a laser metal cutting machine. The best compressor plates are elegantly designed so as to provide for a higher fatigue resistance; an over-engineered valve plate costs more to design, more to produce, and more to operate, as it will most likely prove to be inefficient. 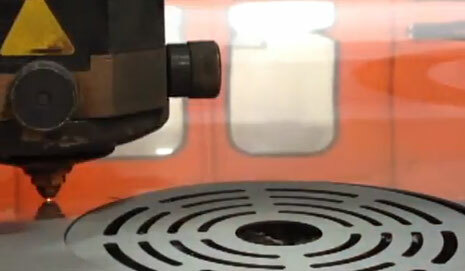 Laser profiling and cutting is the process by which machine parts are scored with incredible precision. Since Grade 410 stainless steel matches well to this process, it is ideal for maintaining efficiency. Grade 420 stainless steel is a good choice as well. A correct seal means a safely working piston, as well as an absence of valve wear and debris in the system. When a compressor plate is laser cut, it is exactly measured and sliced, meaning that it will provide for a perfect fit within the machine. With not even the smallest area of the machine part rubbing or banging against other parts, efficiency is increased and the lifespan of the valve plate is improved. Imperfections on the surface of the part are eliminated, and the smooth surface is easier to clean and maintain. Precise cutting makes for precise machine parts. When a valve is accurately scanned and cut, it is more reliable and can be depended upon for each work cycle. Further quality control tests and inspections are also important, as are the steps of flattening and finishing.